You are at:Home»Columns»From the Sidelines»What happened on August 12, 1872? What happened on August 12, 1872? FOR years, Sarawakians and Sabahans paid no heed to a serious error by accepting August 31 as the day our Nation was born. We even accept that historic rallying cry – Merdeka Merdeka – by Tunku Abdul Rahman on that date as the acclamation of our independence. Now we all know this is not the case. August 31 is the date when Malaya gained independence in 1957 – not when Malaysia was formed in1963. Kudos to Prime Minister Datuk Seri Najib Tun Razak for heeding the voice of East Malaysians and gazetting September 16 as the actual date of the formation of Malaysia. We have been wrong for so long on the actual date of the birth of our Nation that there was real danger we were starting to think we were right! Why the fuss over the date, some might wonder. Well, it’s no small matter because accepting August 31 as our Independence Day means we also accept that Sarawak and Sabah joined Malaysia rather than being one of the four equal partners (Malaya, Sarawak, Sabah and Singapore) which formed the new Federation in 1963. Claims that Sarawak and Sabah were absorbed into the federated states of Malaya through the formation of Malaysia have never failed to raise hackles in the two Borneo states. Anyone who state this claim is walking on the fighting side of me and I am sure of all East Malaysians as well. In fact, if we really want to be fussy about the date Sarawak gained independence, we should declare July 22 as Independence Day for the state because that was the day the British granted independence to the state to pave the way for the formation of Malaysia. This rigmarole over dates and anniversaries reminds me of another significant date in the history of our state, specifically Kuching, which almost everyone has overlooked. We all celebrate City Day on August 1 because that was the date Kuching attained city status but what about the day Kuching was born? How old is Kuching? Well arguably, Kuching is 141 years old and it just celebrated its birthday on August 12. If you dig deep into the annals of the state’s history, you will find that the second white Rajah, Sir Charles Brooke, officially named the capital of Sarawak Kuching on August 12, 1872. This brings us to the origin of the name Kuching which has been the subject of much speculation and wild claims. I wrote on this subject in a feature published in The Borneo Post on October 28, 2007. Now that we are on this subject gain, I will touch on it briefly. 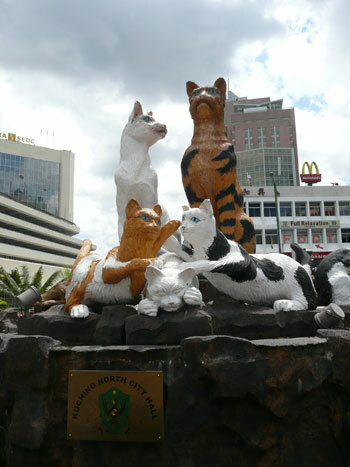 It is imperative we realise Kuching has nothing to do with cats. One of the most popular myths is that the city got its name through a communication breakdown between Sir James Brooke, the first White Rajah, and a local Malay man who mistakenly thought Brooke was referring to a cat which happened to be passing by when Brooke asked him the name of the town. Thinking Brooke meant the cat, the Malay man answered “kuching” which is cat in Malay and the Englishman took it for the name of the town. The fundamental error in this claim is that Sarawak Malays call cats ‘pusak’ not ‘kuching’ which is a peninsular Malaysian word for the feline. Kuching is actually named after an old well located at Upper China Street near the St Thomas’ Cathedral. It was the well where the locals got their drinking water from back then. It was only in 1895 that Kuching was supplied with piped treated water with the completion of the town’s reservoir at the present Reservoir Park along Jalan Budaya. With its redundancy, the old well was covered up and a row of shophouses built over it. The well may be forgotten but before it was covered up, it lent its name to the capital of Sarawak. The area where the old well was located was referred to by the Chinese as ‘ku-ching’ (which means old well in mandarin). Before 1872, Kuching was known as Sarawak which must have created a lot of confusion because James Brooke named his Raj carved out of the Brunei Sultanate as Sarawak after the Sarawak River which runs through the town. So there was a time when Sarawak was the capital of Sarawak and compounding the situation, the state’s main river at that time was also called Sarawak. Perhaps to clear this confusion, Charles Brooke decided to name the whole town Kuching which, at that time, was merely a section of the present capital of Sarawak. I believe there is no stronger claim to the origin of the name Kuching than this story of the old well. But we have been wrong in associating the city with cats for so long we thought we were right! We even have a Cats museum to back that claim and the city has endeared itself to cat lovers all over the world. The old well is an inconvenient truth and let’s face it, cats have a greater appeal than an old watering hole! I am all for Kuching the ‘Cat City’ – sometimes it’s better to let a sleeping cat lie. But spare a thought for August 12 – perhaps we should dedicate that date as Kuching Day to mark the birth of the city.